Snakes use their tongues to collect information about their surroundings. Their tongues collect chemicals from the environment and deposits them in the openings of the Jacobson’s organ -- the primary component of the vomeronasal system. Because the Jacobson’s organ has two openings, the snake's tongue is bifurcated. Some snakes also use their tongues as part of defensive displays -- when confronted by a predator, these snakes slowly extend their tongues in an exaggerated fashion. 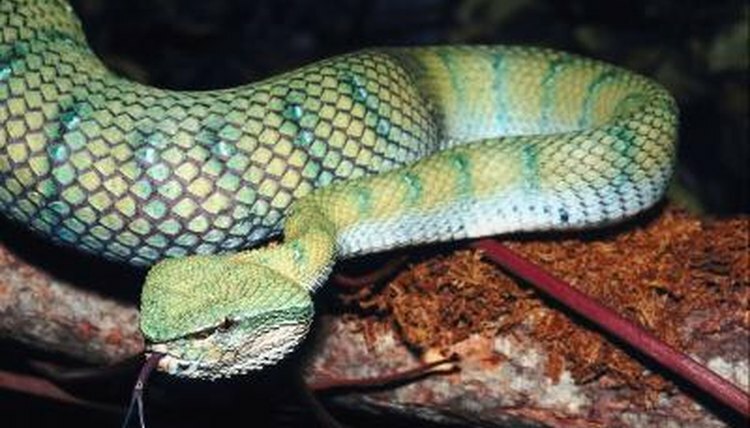 Various snake species have different colored tongues. Some species have dark colored tongues, while others are bright red, blue or cream. In some species -- garter snakes (Thamnophis sirtalis ssp.) provide an excellent example -- the tongue is often red at the base, while the tips are black. Individual variation exists in some species as well, with different specimens exhibiting differently colored tongues. Amelanistic or albino animals often have very light colored tongues. Why Is a Lizard's Tongue Split?